Published on 8 January 2014. 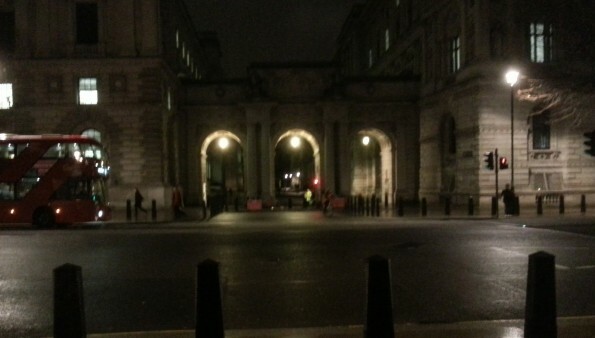 The best I’ve come up with today is this blurry picture of the arch where King Charles Street meets Whitehall. I thought it looked quite pretty lit up, but the detail is lost in the blurriness. Here’s what it looks like when competently photographed in daylight (from the other side)! You’ll also notice the bollards lining Whitehall in this photo – they look sort of dainty and decorative, but whenever the pavement is dug up for maintenance, one can see how far down into the earth they go, and the size of their impressive below-ground hulk. They’re also quite a bit wider than they appear to be at a glance – I assume their taper is designed to induce that optical illusion. Essentially. they are absolute beasts of bollards in iceberg-style decorative clothing! This 2,108th post was filed under: Photo-a-day 2014, Scrapbook.